Brighouse Town boss Vill Powell. Brighouse Town lost their seventh pre-season game ahead of the new campaign after they were undone by a last-minute strike at home to Clitheroe. Vill Powell’s side have won just one of their nine friendly encounters and will play their final pre-season game on Thursday evening. They host Prescott Cables at the Yorkshire Payments Stadium, hoping to go into next Saturday’s (August 18) league opener against Gresley FC full of confidence. Town named five trialists in their starting line-up yesterday evening and it was one of these trialists that gave them the lead. 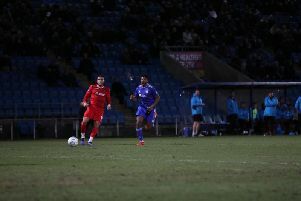 The goal came on 40 minutes but it took the visitors only three minutes to respond as they were awarded a penalty. The spotkick was well saved before the rebound was scrambled home to make it 1-1. And it stayed that way until the 90th minute when Clitheroe snatched a late winner.